People talk about people with horn in music and movies. But today I am not going to talk about the 1950 film “Young Man with a Horn” or the novel it was based on or the songs titled Man Horns but the real horns on real people’s head! It is so strange and scary. 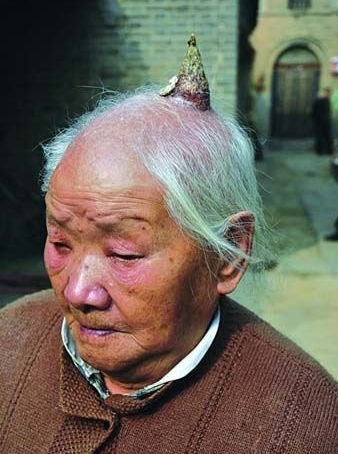 Ma Zhong Nan, a 93-year-old man living in a small village in China, recounts how a horn began to sprout on his head five years ago. Ma was combing his hair one day and carelessly injured his scalp. Because it was just a small wound, he did not pay much attention to it. Little did he expect that a thick, hard substance started to grow on his head. Since it did not bother him, he just ignored the growth. But the growth just kept getting bigger and harder, forming a horn of about 10cm (4 inches) long half a year later. In another news, an old man with horn is also spotted in Yemen. Saleh Talib Saleh used to dream that he would grow horns on his head. He dismissed them as mere fancy at first, but then, at the ripe old age of 78, a horn did indeed begin to grow on the left side of his head, astonishing his fellow villagers. Saleh, a resident of Adban district of the Shabwa governorate, claims that the horn started growing over 25 years ago. He has no explanation as to how the horn developed or why. The old man told that he is grateful to God for this unique blessing. Those two were the news article so authincity of which can’t be argued upon. I found he photo shown below while searching internet so I don’t know if it is for real or not. Anyway if it should be really inconvenient to have horn on top of your nose. Well, don’t know how he can wear glasses if he ever had to. It sure is a strong horn! Oh man, that is WILD! I don’t think that last one is real either. Even i personally saw one related case here in Pakistan and it was really weired. Am greatful to God for we all are not having any such problems. WOW, I really had no clue people could actually grow horns!